Soccer Goalkeeper | What does it take to play as a goalie? Why in the world would anyone want to be a soccer goalkeeper?! A good soccer goalkeeper is the most important part of the team. There is nothing more deflating than letting in a bad goal, or quite as inspiring as a keeper making a timely save. Needless to say, the pressure on goalkeepers can sometimes be overwhelming. Believe it or not, being a goalkeeper is actually a pretty popular position for children. This despite the face that it's an intense, pressure packed position, and can make even the most level headed individual crumble. That said, there's something quite satisfying about making the impossible save and denying the opposing team what they think to be a sure goal and giving your team a boost. Soccer goalkeepers come in all shapes and sizes, from the 6'5" Edwin van der Sar, to the 5'6" Jorge Campos. While it's true that physical stature can be a great asset to have, Campos proved that anyone can be a successful goalkeeper if they put in the effort (He also made himself some pretty nice looking jerseys). These skills play a part in explaining why most keepers don`t reach their prime until much later on in their careers when compared to outfield players. 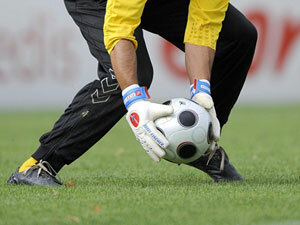 Most good soccer goalkeepers have a kind of controlled confidence to them that some may say borders on arrogance. It's important for keepers to remain down to earth and walk the line between confidence and cockiness. There must also be a strong work ethic and degree of self motivation so that they don't become complacent after a good outing and neglect their training. Given the goalie's position at the back of the pitch, leadership is essential. Keeper's must take control of their back line and be vocal with their team, as their view of the game is unlike any other player on the field. Lastly, while unfortunate, the keeper must understand that regardless of how many great saves they made in a match, they will all be forgotten if a weak goal is conceded. It takes an emotionally strong individual to deal with that kind of pressure.